Four Israeli bulldozers, D9 type, on Sunday morning advanced a limited distance into the northern area of Beit Hanoun in northern Gaza Strip and started leveling land, according to the PIC reporter. In the evening, Israeli Occupation Forces (IOF) opened gunfire at Palestinians’ agricultural lands east of Rafah city in the southern Gaza Strip resulting in no casualties or damages. On a semi-daily basis, the IOF soldiers target by shooting Palestinian farmers and hunters along the eastern border line between the besieged coastal enclave and 1948 Occupied Palestine. Fadel Abdul Ghani, director of the Syrian Network for Human Rights (SNHR), said that Syrian civilians who survive bombardment by the Assad regime and its allies often die under torture in Assad’s prisons or in summary executions by his militias. In a report marking the sixth anniversary of the Syrian revolution, Abdul Ghani said that aerial bombardment by regime forces did not stop despite the ceasefire which came into force in December 29. He noted that aerial bombardment continues to cause civilian casualties, especially in the Dara’a, Eastern Ghouta, Idlib, and the Alwaer district in Homs in Homs. Abdul Ghani pointed out that the Assad regime and its Russian allies continue to violate the ceasefire agreement despite Russia being a guarantor of the agreement. The SNHR has documented daily deaths of detainees in Assad’s prisons who either die under torture or are executed after show trials in violation of international law and international humanitarian law, Abdul Ghani added. According to the rights group, over 447 detainees died under torture in the prisons of the Assad regime in 2016. The SNHR documented 7,543 people, including 251 children and 448 women, who were detained by the Assad regime the same year. The Network said that at least 12,882 detainees, including 161 children and 41 women, have died under torture in regime’s prisons since revolution started in March 2011. The Israeli forces on Sunday morning launched a round of massive military maneuvers across the Negev region. The Israeli army spokesman said the prearranged military maneuvers make part of the annual drill plan. The drills are expected to be wrapped up next Wednesday. Red sirens are expected to be set off across the Negev starting 11:05 a.m. on Tuesday. BETHLEHEM (Ma’an) — The number of Gaza residents that were allowed to enter Israel dropped by 40 percent last month compared to the 2016 monthly average, according figures from legal nonprofit organization Gisha cited in a report published Saturday by Israeli daily Haaretz. Furthermore, the number of Palestinian businesspeople who entered Israel from the besieged coastal enclave fell by 60 percent compared to February 2016. 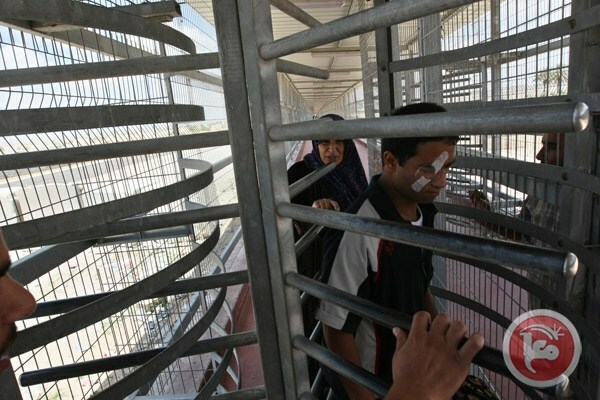 The report said that in Feb. 2017, only 7,301 people passed through Israel’s Erez crossing — the only land crossing for Palestinian civilians to access Israeli from Gaza, which is heavily restricted by Israeli authorities as part of a crippling blockade on the coastal enclave in place since 2007. According to Haaretz, the figure represented the lowest number of people allowed to pass through the checkpoint since the end of Israel’s devastating assault on the Palestinian territory in 2014. The figure was just over half of the number of permits issued in February 2015, while the monthly average for 2016 was 12,150 people. The report said that the greatest drop in permits was among Palestinian traders, including those with many years’ experience in the business. Gisha recorded only 3,287 exits for traders in February, a drop of over 50 percent compared to the monthly average in 2016 (6,637) and a 60 percent reduction compared to February 2016, when the figure was 8,226. Only 1,363 traders currently have valid entry permits, which is just over a third of the some 3,600 permits Israel had approved in late 2015, and about a quarter of the quota set by Israel, which Haaretz said was never filled. Israeli forces had detained some 20 businesspeople from Gaza during 2016 for various reasons, a source at the Palestinian liaison office told Ma’an in November. Gisha based its figures on information from the Palestinian civil commission, the official body that works with Israel’s Coordinator of Government Activities in the Territories (COGAT), the body responsible for imposing Israeli policies in the occupied territory, such as the issue of Israeli entry permits for Gaza residents. The decade-long Israeli blockade has plunged the Gaza Strip’s nearly two million Palestinians into extreme poverty and some of the highest unemployment rates in the world, which reached 42 percent last year. Gaza’s infrastructure has yet to recover from the devastation of three Israeli offensives over the past six years. The slow and sometimes stagnant reconstruction of the besieged coastal enclave has only been worsened by the blockade, leading the UN to warn that Gaza could be “uninhabitable” by 2020. Israeli military aircraft have launched three airstrikes in the northwestern part of the Gaza Strip as the Tel Aviv regime goes ahead with its acts of aggression against the besieged Palestinian coastal territory, local sources say. Local sources, speaking on condition of anonymity, said an Israeli combat drone had struck a military site in al-Sudaniya district on Saturday afternoon, completely destroying the building, Arabic-language Wafa news agency reported. An Israeli F-16 fighter jet fired two missiles into the same area shortly afterward. No immediate reports of casualties were available though. The developments came only a few hours after Israeli battle tanks fired three rounds of shell at a site northwest of Gaza City and another target in Beit Lahia city. No injuries were reported. Earlier, Israeli media outlets claimed a locally-made rocket had been fired from the Gaza Strip, and landed in an open area in southern Israeli-occupied territories, causing no damage or injuries. On March 16, Israeli military aircraft targeted areas west of Dayr al-Balah city in the central Gaza Strip, and an empty patch of agricultural land east of Gaza City. No injuries were reported. Israeli F-16 jets also bombed Shuja’iyya neighborhood in Gaza City, causing power outages across the area. On March 9, Israeli shells slammed into the southern Gaza Strip city of Khan Yunis, al-Qararah town north of Khan Yunis and Dayr al-Balah, but there were no casualties. At least four people sustained injuries on February 27 after Israeli fighter jets struck the Nahda neighborhood of the border town of Rafah. Israel has also launched several wars on the Palestinian sliver, the last of which began in early July 2014. The Israeli military aggression, which ended on August 26, 2014, killed nearly 2,200 Palestinians. Over 11,100 others were also wounded in the war. The Egyptian Court of Cassation issued a ruling March 2 acquitting ousted President Hosni Mubarak of the killing of protesters during the outbreak of the January 25 Revolution in 2011. On March 13, an Egyptian prosecutor issued a decision to release Mubarak for the first time since his ousting six years ago. This raised speculation about whether Mubarak, 88, intends to return to the political scene and how the regime of current Egyptian President Abdel Fattah al-Sisi will deal with him. Mubarak stepped down six years ago, 11 days after the outbreak of the revolution; he was subsequently brought to trial.” He received a prison sentence of 25 years in June 2012, but his defense team appealed the ruling and ultimately got him acquitted in March. During those years, Mubarak was tried on power corruption charges, and he received a sentence of 3½ years, which he has completed. Meanwhile, investigations are still underway into his charges over illicit gains. Mubarak was arrested in April 2011. He was admitted to the Tora Prison Hospital and then moved to the Maadi Military Hospital in southern Cairo due to his deteriorating health at the time. According to Yousri Abdel Razek, a volunteer lawyer with Mubarak’s defense team, he remains at the military hospital. On March 14, Al-Shorouk newspaper reported that the Egyptian prosecution sent an official letter to the Ministry of Interior about Mubarak’s release decision. Several Egyptian media outlets claimed that Mubarak will move to live in a villa near the Al-Ittihadiya Palace, which is the residential palace of the president, given the heavy security presence on the roads leading to and from it. Abdel Razek told Al-Monitor that the prosecutor’s decision legally settled whether or not Mubarak will be allowed to leave the Maadi Military Hospital, but it will be up to the security authorities to decide the date of his move to the villa and to take the necessary security measures. Journalist Abdullah al-Sinawi said that Mubarak’s release is legally right, but that he is not allowed to return to the political scene given the charges of misappropriating presidential palace funds. Asked about the reaction of the Egyptian people, Sinawi told Al-Monitor that Mubarak is a sick man who is almost 90, and he will live in his house. Egyptians do not want to take revenge on Mubarak; rather, they want to get rid of his regime and its policies. Sinawi said the people do not want the same Mubarak policies to be applied now, and that the current regime is facing a real challenge to boycott the policies of the past. Mustafa Feki, Mubarak’s secretary for media affairs between 1985 and 1992, said in a TV interview in early March that the return of the Mubarak family to the political scene would be like “playing with fire.” He added that the former Egyptian president will still have influence on the public opinion because he governed for 30 years. Eid told Al-Monitor that the current regime is an extension of the regime that was in place prior to the January 25 Revolution and will therefore not take any action against Mubarak. He pointed out that his two sons, Alaa and Gamal, have been living in freedom since their release in January 2015. Also, he said that the current regime hired advisers and ministers that were Mubarak’s men, whom the revolution partly targeted. “The current regime’s policies are the same policies of Mubarak’s rule, which lasted 30 years,” he added. Said Sadek, a professor of political sociology at the American University in Cairo, said Mubarak’s release would not affect the political landscape and the current regime, telling Al-Monitor that the verdict on the presidential palaces case banned Mubarak and his two sons from engaging in public work and restoring their political rights to run in elections or to join a political party for a period of six years. Sadek believes that the Egyptian revolution in 2011 served to put an end to the Mubarak era and sparked “outrage” among the people against his regime. Also, his loyalists got involved in the current regime out of fear for their interests, which were affected following the revolution. He added that reports about the return of Mubarak and his two sons to the political scene and their running for the elections are unreliable since the people are enraged and do not tolerate the Mubarak family. In addition, he said the current regime would not allow them to run in any elections and return to the political scene, and that it would block them as it did with businessman Ahmed Ezz, the most prominent figure of the Mubarak regime who was dismissed from the parliamentary race in 2015. Sadek said that Egyptians are currently too busy trying to overcome the severe economic crisis plaguing the country to even think of the issue of Mubarak’s release. According to him, Egyptians were convinced Mubarak would ultimately be acquitted. Hassan Nafaa, a professor of political science at Cairo University, said that Mubarak’s acquittal proved that his trial was not serious and that the regime that ran Egypt after the January 25 Revolution sought to rescue the Mubarak regime and his policies. Nafaa confirmed that the current regime will allow the release of Mubarak and will let him live the remainder of his life and enjoy the money he obtained from the blood of the people, ruling out the return of Mubarak or his two sons to the political scene. President Mahmoud Abbas on Saturday said he would award the highest Palestinian medal to former UN official Rima Khalaf for her courageous stand for Palestinians, local media reported. Abbas informed Khalaf about his decision in a telephone conversation in which he congratulated her for standing for humanity, true values and loyalty to international law, state news agency Wafa reported. Khalaf resigned Friday from her post as Executive Secretary of the United Nations Economic and Social Commission for the Western Asia (ESCWA) after UN Secretary-General Antonio Guterres forced her to withdraw a report that accused Israel of operating an “apartheid” regime. Abbas said Palestinians appreciated Khalaf’s humanitarian and national stances as she refused to cover up crimes committed by the Israeli occupying authority against the Palestinian people. The ESCWA report released Wednesday said Israel “established an apartheid regime that dominates the Palestinian people as a whole” and that there was “overwhelming evidence” Israel had committed the “crime of apartheid”. On the same day of the report’s release, Khalaf said the “ignorance of the international community” in recent decades had “encouraged Israel to continue its abuses of international law”. The ESCWA report was prepared by Richard Falk, an international law expert and former UN human rights rapporteur for the occupied Palestinian territories and, Virginia Tilley, a political science professor and Israeli affairs expert. Established in 1973 to promote economic and social development among member states, ESCWA is currently comprised of 18 Arab nations.